Berg Consulting Group, Inc.Good Times Don't Last Forever - Berg Consulting Group, Inc.
Do you have a formal plan for your company’s future? Does your plan consider the impact of simple growth & decline in the general economy? How about indicators specific to the background screening industry? What about changes in technology? Is there an exit strategy outlined in your short or long-term plan? Background Screening Business owners should create and review their strategic plans TODAY because there is an indication that the record-strong U.S. economy may be shifting this year. Are we still going to be in a seller’s marketplace like we were in 2018? Is there another recession looming? Clearly we don’t have all the answers. What we do have are today’s facts that help us to make informed decisions and plans. Currently we live in a period of continued economic growth. Total non-farm payroll employment increased by 312,000 in December of 2018. Another indicator of the strong economy is the GDP growth rate which currently sits between 2.5 and 4.2%. Depending on how you view the world you could find numerous other metrics that point to continued growth in the economy. However, there are signs of change. The government shutdown started to impact consumer confidence. Steve Rattner, a former US Treasury advisor recently noted that 25% of US economists think we will see a recession by 2020. We have not seen this percentage of economists with a negative outlook since 2011. Historical data can be an indicator as well. Looking back a few decades, we see that 1990, 2001 and 2008 are the years in which economic growth ceased and the US economy entered into recession. Below we will look more closely at these dates. So, what about 2019? Let’s take a closer look. All forecasters look to history as an aid to predict the future. 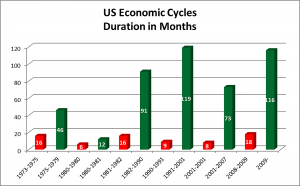 In forming an opinion of where 2019 could take us, we look to one interesting piece of historical data: the US economic business cycle. Throughout recorded US history we’ve had a total of 49 recessions. The following chart shows periods of US economic expansion and recession (from 1973 to present). In red we see the periods of recession (months). The longest recession on our chart, known as “The Great Recession”, was the most recent and lasted 18 months. Notably, the longest period of growth on record was from March 1991 to February 2001 or 119 months. When we looked at this metric something jumped out at us: in March of 2019 the US economy’s current growth period will match that of the previous longest growth cycle. Is this a harbinger of what will happen in March? Will we create a new record of sustained economic growth? When will that growth stop? What do you do with this information? Do you have a gut feeling? 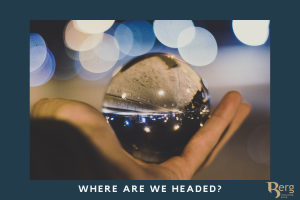 NOW is the time to review your strategic plan for 2019 and 2020 (or create it if you don’t have one). What assumptions have you made about the future US economy? Have you assumed the economy will continue on the same macroeconomic growth we have seen since 2010? If your gut is telling you that a recession could be looming, why not revisit your exit plan before the recession hits? Remember when 2008 happened? Did you have any pending deals that fell apart and disappeared when the economy tanked? How long did it take your company to bounce back from the recession? The actual recession lasted roughly 18 months so maybe it took you two years to recoup all of your lost sales volume. Maybe longer? By no means is this meant to be a scare tactic or even a call to action…but it does put things into a bit of perspective. When setting your goals and expectations for the future, consider the indicators noted above. Timing is everything, and as we know, good times don’t last forever. If you don’t have a plan, put one together and talk to our seasoned M&A expert Evan Zatt about your 2019 plan and exit strategy options. No charge. For guidance on background screening business standards, read Berg’s Background Business Benchmarking Blue Book. To read the first issue in the Berg Consulting Group Bottom Line series, click here.